This week I am studying Self-Control as it pertains to the final aspect of the Fruit of the Spirit. It is not a coincidence that this is the last aspect following the other eight elements of the Fruit: Love, Joy, Peace, Patience, Kindness, Goodness, Faithfulness and Gentleness. For if we practice the other eight consistently and intentionally, the ninth should come easily. Right? What does self-control mean to you? Not eating that second slice of cake? Passing on that next blockbuster hit due to its “R” rating? Putting yourself to sleep early instead of finishing that chapter in your book, or watching one more episode of Glee on Netflix? Or does it only pertain to extreme acts of violence, drug or alcohol abuse, sexuality, foul language, stealing or lying? We all have our weaknesses. Having self-control is only possible once we become aware of them. One sign I am “giving-in” to a weakness is when I argue with myself and start to justify that what I am about to do “isn’t that big of a deal.” What is worse is that lately I have become so aware of this tactic to indulge, that if I feel myself beginning to justify, I either give in immediately or walk away from the situation. Often, my fear of what others may think about my choice will direct which path I choose. How can such a simple statement, made thousands of years ago, still be so relevant to our lives today? If we are honest with ourselves, we know that when we give into self-indulgence, we always become weaker. Our guard is down, and we can often move well beyond the line we said we would never cross. Personally, I am not battling with any major, moral dilemmas. But the consequences of my little compromises often prove more difficult than I initially anticipate. 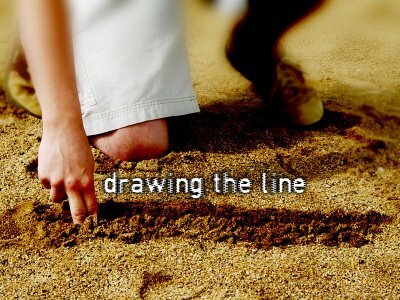 The more we give in, the less we become aware of where that line used to be. Soon it becomes so fuzzy, we hardly know it is there at all. Yet, as we compare ourselves to the worst members of society, instead of to the One who gave everything to save us from ourselves, a pattern begins to emerge. What is horrible and detestable in one generation soon becomes the acceptable norm in the next. How those acts hurt us does not change. We simply get better at justifying them and ignoring the consequences. Each of us must look within ourselves, without a spirit of condemnation, and ask– is this really what is best for me and those I love? Does this act have the potential of impacting other lives, perhaps even those I do not know? Could this choice, made out of a lack of self-control, result in more painful consequences than simply doing the right thing to begin with? More often than not, we must plan ahead for such situations. Without starting an argument of morals and ethics, I will use a few common but less controversial, examples. I am personally faced with a challenging choice every day. Should I eat it or not? Instead of facing weight gain, I face an irritable bowel. I have tried to ignore it, tried to justify the results of eating the wrong foods as “not that bad”, tried to go extreme in the “right” direction only to end up with rotting food and overreaching my grocery budget. With this challenge I also face the long-term consequence of how these choices can affect my children and their own eating habits. It can be a very stressful day in the King household when Mom has to choose between the more difficult-to-prepare, healthy meal and the easier, not-so-healthy alternative. One meal will likely result in immediate cheers and smiles while later causing belly aches and tears. The other may cause tears to start, but will result in nourished bodies and a more restful sleep. Can anyone else see a parallel here? Immediate gratification almost always results in long-term pain. In order to avoid this dilemma, I must plan our family meals very carefully. I have created a menu of healthy meals, with most ingredients ideal for our tummies. The meals are simple, and use relatively inexpensive ingredients. I stock up on the expensive ingredients in advance, to save both time and money. On a good day, I begin preparing for dinner at about 2pm- sometimes even prepping part of it while I am making lunch. On a good week, I have purchased at least 10 days’ worth of meal items in advance so that I have some flexibility about what I cook and when. If I plan on making meatloaf on Monday, but the day’s obligations have made it difficult to prepare, I always have those Tilapia fillets ready to thaw in a bowl of cold water and later throw in the over for a fast, yet still healthy, meal alternative. I can relate this same discipline, planning and preparation to my writing life as well. One week I had Wednesday set aside for writing and mailing out 3 query letters. However, I did nothing on Monday or Tuesday to prepare for this task. I ended up spending most of Wednesday researching one topic, and only sent out one letter. The next week, I started thinking about my article topics on Sunday. Monday the kids didn’t have school, but I took them on a family field trip where they could have fun while I researched a topic at the local exploration center. Tuesday, I conducted internet research on the second and third topics. By Wednesday, I was able to complete my goal of all 3 queries! I realize the whole concept of planning ahead is not new. But how often do we consider planning ahead for circumstances which may put us in a position to compromise those things we hold dearest to our hearts? Knowing where we will draw the line, and working out the “what ifs” long before we must make that difficult choice will equip us with more power, and more self-control than living life on a whim ever will. What areas do you struggle with regarding self-control? Can you think of ways you can begin to gain control over these areas by doing a little advanced planning? I would love to hear your thoughts on this!